Highest Accomplishments: Steve’s highest accomplishments was taking 6th for the series. Steve and Jim have been wheeling for close to 19 years each. We both have a love and passion for offroading. 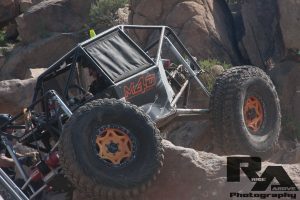 Steve started Moab 4×4 Outpost in 2004 after working in the industry for ten years at various shops. Jim moved to Moab and started Outlaw Jeep Tours in 2009 with two jeeps and since then has built his fleet to seven jeeps and a RZR. Steve and Jim are on the trails as much as possible because it is our way to have fun and challenge ourselves against our environment. In 2016, Jim sold Outlaw Jeep Tours and has since moved to the St. George area, opening Sand Hollow Offroad soon.